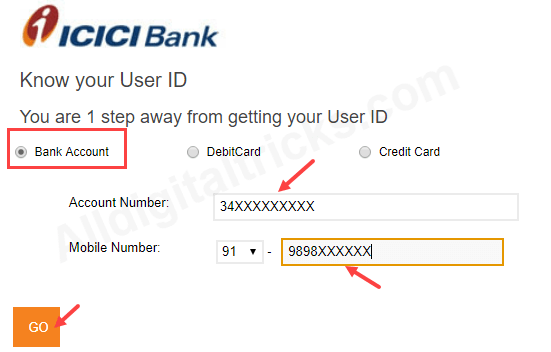 Forgot ICICI Bank net banking User ID? Well, you can easily find/ recover your User ID online by following below simple steps. India’s largest private sector Bank ICICI gives you net banking and mobile banking facility to access and manage account online. To register for ICICI net banking you need User ID and login password. When you open an account in ICICI, you will get your customer ID to access net banking facility. You can also able to change this user id later through net banking. For some reasons suppose you forgot your ICICI User ID and want to recover it, here is simple steps to find it. Make sure your mobile number is registered with your bank account and it is active. If your mobile number is not registered with your bank account OR you want to change it, simply visit nearest ICICI ATM and register/change it. 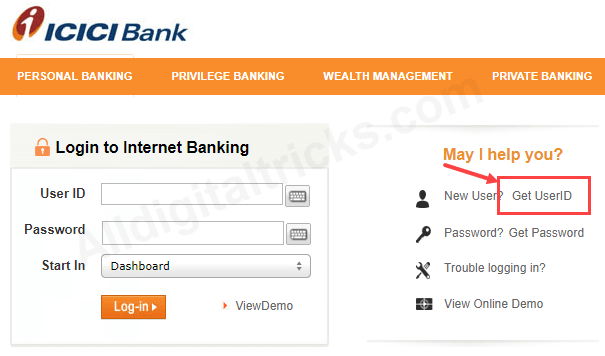 1: First open ICICI net banking login page and click on Get User ID. 2: On next page click on Click here to proceed. 3: In last step, select Bank Account option and enter your saving account number & 10-digit registered mobile number and click on Go button. That’s all, you will receive your ICICI bank User ID on registered mobile number via SMS. 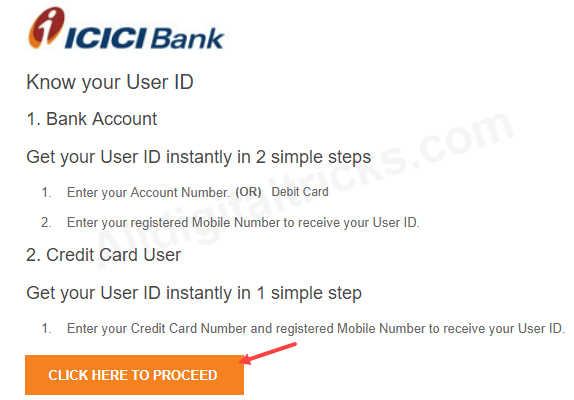 So this way ICICI Bank customers can easily retrieve their net banking User ID online. After getting user id you can generate your login password and activate net banking facility.